This peanut butter chocolate pretzel cake holds special significance to me and it’s only made once a year for a special person. Let me tell you why. I’m terrible at remembering birthdays. Honestly, I’ve been mixing up my sister and dad’s birthdays for the longest time until I finally put it in my calendar last year as a recurring event. (They’re a couple days apart in late January!) Now, it’s not that I dislike birthdays or anything, but I don’t make a big of hubbub about it like some people do. There’s no birthday countdown, no month of birthday celebrations, or gleeful counting of how many Facebook birthday posts I acquire. If we just go to Souplantation for dinner and you let me drown a bowl of chocolate lava cake with frozen yogurt, I’ll be as happy as can be. I had made a peanut butter chocolate cake for Sam’s pre-treatment gathering a couple years ago. Knowing that peanut butter chocolate was Sam’s favorite flavor, I hoped he’d be able to enjoy a slice, but understandably, he didn’t have the appetite for it. When doctors gave him a clean a clean bill of health after treatments last year, I knew this was the only cake to make to celebrate such good news. Unfortunately, Sam went through it all plus more this year but came out on top again; he’s awesome like that. 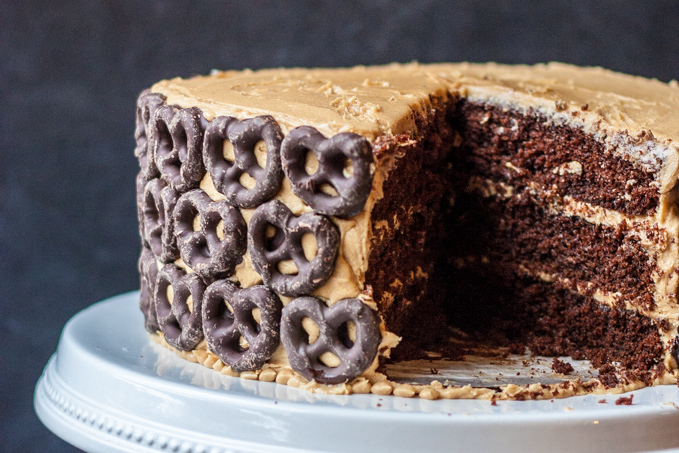 Now this monstrous peanut butter chocolate pretzel cake is a birthday tradition. 2015’s even put on some airs with a fancy cake stand, decorative piping, and dark chocolate pretzels. 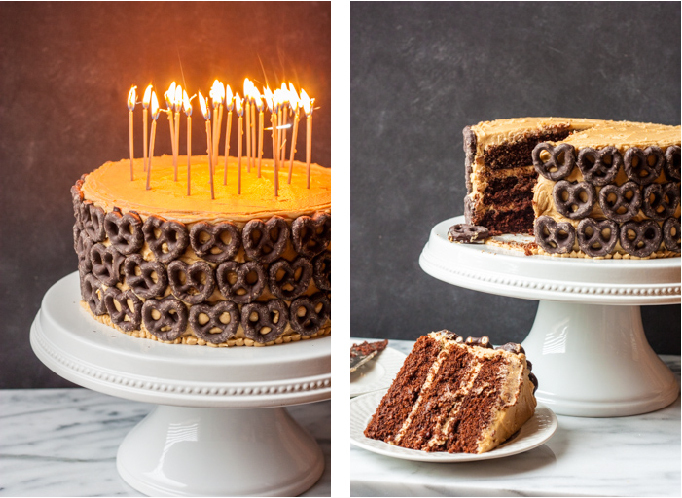 This peanut butter chocolate pretzel cake is simple and most of the wow factor stems from the pretzel pattern and the sparkler candles. I’m always game for trying new cakes, but Ina Garten’s Beatty’s Chocolate Cake recipe unfailingly works and always reels in the compliments. 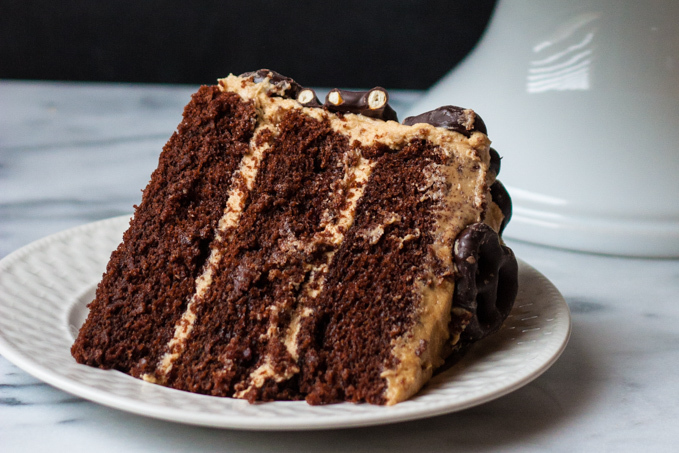 A creamy and light peanut butter frosting encloses our moist chocolate cake and makes you wonder if it would be a bad idea to keep the extra frosting around just to eat on whatever else you can get your hands on. I doubled Ina’s cake recipe since my pans are 9 inches wide and I wanted three layers for an impressive cake. You can use whatever pans you like, but make sure to leave room in the pan for it to rise. You don’t want this delectable cake batter dribbling down the sides of you pan and into your oven. If you use a 9 x 12 pyrex or a tall springform pan, you can probably get away with pouring a full Ina- size batch of batter. Just place a sheet pan underneath it as a cheap, oven-spillage insurance policy. 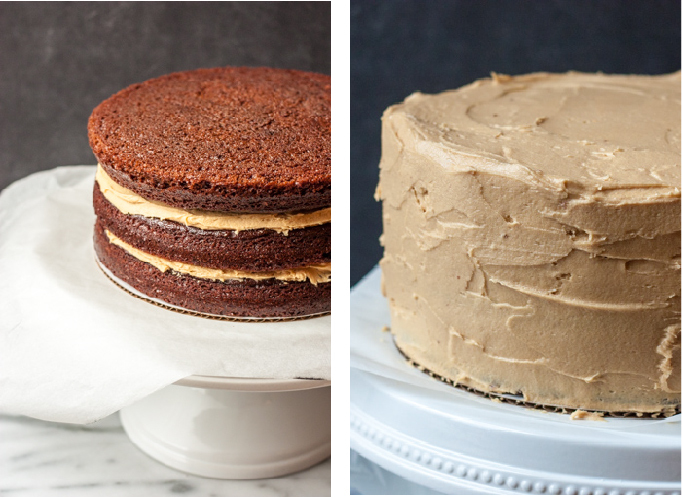 For more layer cake tips, take a peek at Mocha Cake with Espresso Whipped Cream to streamline your cake making process and hopefully spare you from assembly heartache and frustration. After using a scale to evenly divide the batter into three parchment lined rounds, I give the pans a good rap on the counter and gentle tilt a whirl so the batter is slightly higher on the edges. Oftentimes, cakes bake into a dome shape and you have to shave off the top to level them. This batter bakes up relatively flat, so take advantage of nixing the cake leveling (read: wasting) by giving it a little help with a couple tilts before baking. Once the cakes are set, but still slightly springy, remove them from the oven and let them cool. Run a butter knife around the edge to loosen the cake and turn them out. I like to wrap up my layers and freeze them overnight so I am absolutely sure that the warm cake won’t melt my frosting. It also make the cake layers sturdier and easier to work with. If you’re in a rush, you can just leave them on a wire rack to cool and cross your fingers that your frosting sticks! 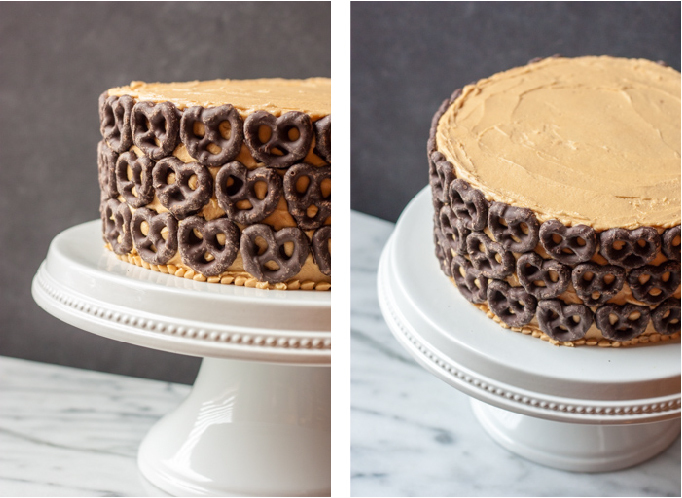 This peanut butter chocolate pretzel cake was a slightly different than others because I had a cake stand (hooray!) and some new cardboard cake rounds. The rounds make transporting the cake much easier but still shows after you frost the cake. I covered it up by piping tiny dots at the base, all the way around, giving the cake a fancier feel and tying in with the design on the cake stand. Making the peanut butter frosting is simple. It’s just like a buttercream, but instead of butter, we use peanut butter! I also use regular creamy peanut butter for this job. Usually, we prefer eating natural nut butters since they have more texture and aren’t as sweet, but for frosting, you might as well start with a sweet peanut butter. Throw in a pinch of salt and a splash of vanilla with the powdered sugar to give the frosting a little more flavor. Whip the frosting on high until the consistency is tacky but not overly stiff. I made quite a large batch of frosting to cover this behemoth of a cake, so if you are doing a sheet cake or a smaller version, you won’t need as much. 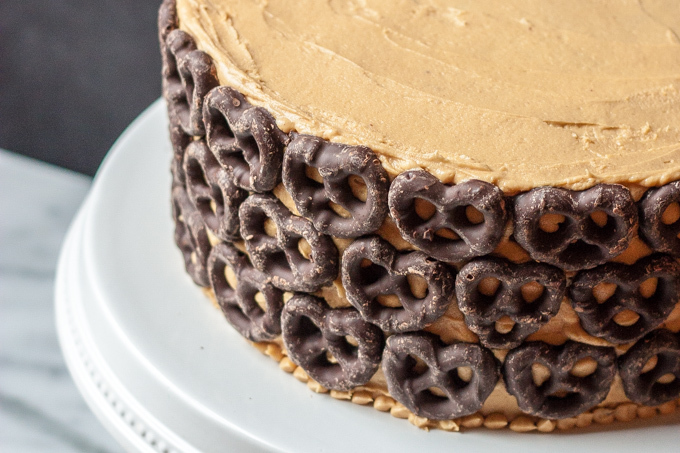 While I prefer to crumb coat, or thinly ice, my cakes first, you can probably get away with not doing it on this peanut butter chocolate pretzel cake as the pretzel pattern will cover up any stray crumbs. I wouldn’t skip it though. It’s a good habit to get into and practice makes perfect! I also piped a row of dots at the base of the cake to cover up the cardboard cake round. If you aren’t using one, you can still add on this decorative detail. Just fill a small ziplock bag with frosting, twist it tight, and snip off a small corner. Once you’ve finished frosting your cake, it’s time for the pretzels! Just like when laying tile on your kitchen backsplash, start at the bottom. This way, the pretzels don’t slip down the cake as you go. I learned that from the Property Brothers, but the physics apply just as well to cake decorating. Depending on the shape and size of your pretzels, you might have to stagger or rotate them for the best fit. The peanut butter frosting holds onto the pretzels extremely well. Just give the pretzels a gentle push into the frosting to snugly glue them to the cake. 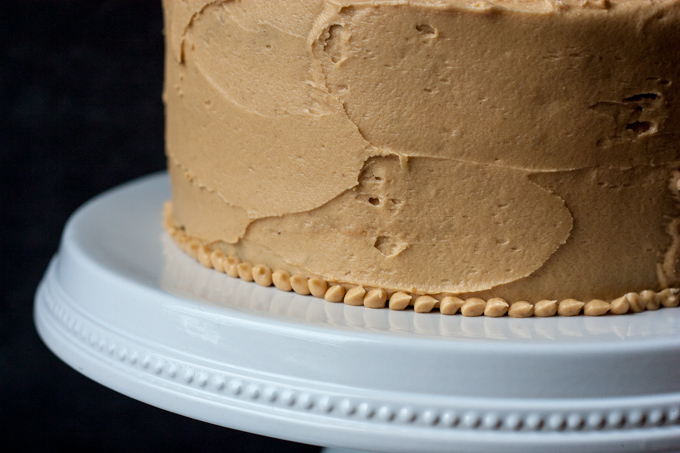 Your peanut butter chocolate pretzel cake is now done and ready to blow friends and family away. Simply stick on the appropriate number of sparkler candles and light it up! Don’t forget to pick off the wax dropping after blowing the candles out. No one wants to eat wax! I like to cut the cake in large slices to preserve the pretzel pattern, but be forewarned that it’s a daunting two-person slice. Unless you’re Sam, which means you can finish 80% of the cake in just four days. I told you he was impressive, didn’t I? Here’s to our wonderful Sam and many more heart-stopping, peanut butter chocolate pretzel cakes to come. Preheat the oven to 350 F. Spray three 9-inch round cake pans with non-stick spray. Line with parchment paper. With the mixer on low speed, slowly add the wet ingredients to the dry. With mixer still on low, add the coffee and stir just to combine, scraping the bottom of the bowl with a rubber spatula. Divvy out the batter into the prepared pans and bake for 35 to 40 minutes, until a cake tester comes out clean. Cool in the pans for 30 minutes, then turn them out onto a cooling rack and cool completely. Keep the parchment rounds on the cake until ready to assemble. Beat peanut butter with a paddle attachment until smooth and add in powdered sugar on low. 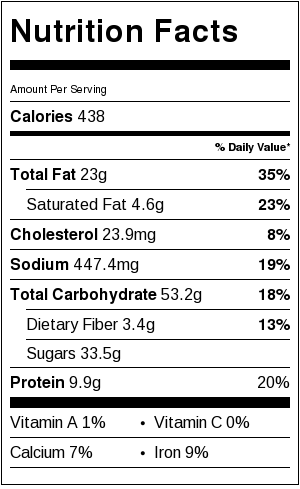 Add vanilla and salt. If the frosting is too thick, add in a little milk to loosen it up. Frosting should be tacky and pliable with medium peaks. Crumb coat the cake (or not, if you like to live dangerously) and then frost. 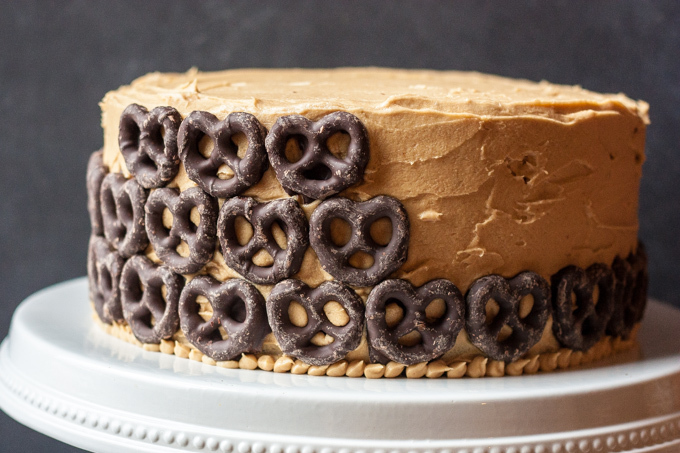 Place chocolate covered pretzels on the sides of the cake by starting at the bottom. You can make whatever pattern you like with pretzels and peanut butter cups! This cake looks so, so delicious! One of my sisters and my dad also have birthdays just days apart in January! I used to always get the dates mixed up when I was young. Thanks Bethany! It really it. And stupidly easy to make, I promise! My dad used to say he got my sister as a birthday gift! I feel like no one can really judge as my parents mix up my sister and I all the time. They’ll be moments when they text or call, thinking I’m my sister, and they don’t realize who I am until I stop them and explain! Thanks June! It’s so easy and basically foolproof!